Experience the thrill of a real World Rally Championship race by taking the controls from your very own Playseat WRC GT. Modeled after the dynamic race seat design of an authentic WRC rally car, this innovative and comfortable seat will make all your driving games feel more like the real thing. Featuring sturdy steel construction, cozy cushioning, and adjustable pedal and wheel plates, this ultimate racing chair is compatible with most gaming platforms and most electronic steering wheel and pedal sets on the market. Please note that the Playseats include no electronic parts. The chairs are simply intended to be incorporated into TV/media/game rooms and used with electronics products. No steering wheel or pedal set is included. Lightweight powder-coated tubular steel frame with high-tension spring and wire system means the chair won’t wobble even as you lean into the turns High profile side bolsters and integrated side head stabilizers create a safe and authentic driving experience during aggressive driving Comfortably drive for hours sitting on the ultra high-density foam cushions; black Alcantara suede upholstery with official WRC branding is reinforced in high-wearing areas with synthetic leather to enhance durability Seat back and base cushions remove and the chair conveniently folds for compact storage Heavyweight powder-coated steel chassis with extra strong oval steel tubing to the pedal support plate; aluminum quick release handle allows multi-point adjustment of the pedal set Universal steering wheel plate fits almost all wheels on the market and fully adjusts via the aluminum quick release handle Hollow-triangle tubing provides stability and space to conceal hardware wiring Compatible with Playstation 2 and 3, Xbox, Xbox 360, Wii, and PCs Compatible with most electronic steering wheel and pedal sets on the market Modeled after real World Rally Championship cars. 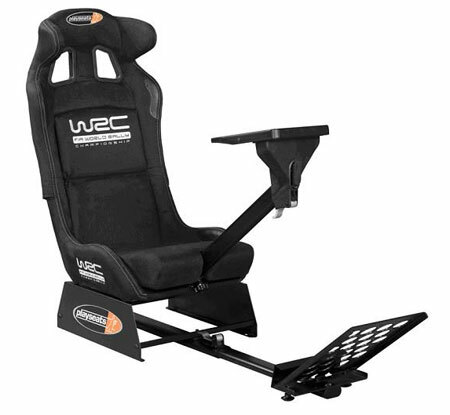 Steel tubular construction adds stability.Get the ultimate professional driving simulator experience with the Playseats World Rally Championship racing seat. Featuring several new modifications not found on previous Playseats models, this chair provides ultimate comfort with a unique style to boot. Modeled after the dynamic race seat styling featured in real World Rally Championship rally cars–complete with head stabilizers–it offers thrill-seeking fans a highly realistic experience of what is widely regarded as the most challenging motor sport competition in the world. Note: Each Playseats product contains everything you need: patented foldable seat; Velcro pads and straps plus screws to securely fix your electronic gaming controllers; assembly tools for a quick build; detailed, easy-to-follow instruction manual; printed manual. Does not include controllers, steering wheels, or foot pedals.